Can’t we all just get a waiver from Obamacare? Unfortunately not, but the list of people applying is getting longer by the day. There are now 1,372 companies, labor unions and states that have applied for and been granted waivers from an early provision of the law that says health policies must provide at least $750,000 a year in insurance protection. In the latest batch of waivers, one in five went to expensive restaurants, spas and other businesses in former House Speaker Nancy Pelosi’s district in San Francisco. What a coincidence! Nearly two dozen states have either applied for or have been granted waivers from an Obamacare provision that forces health insurers operating in their states to comply with strict federal limits governing how much they can spend on administrative costs versus reimbursements for medical bills. And now we learn that the Department of Health and Human Services on Thursday issued regulations explaining that health insurers will have to justify to the federal government health insurance premium increases above 10 percent. But the rules include an interesting exemption for Medicare supplemental insurance policies. Surprise, surprise! The top marketer of these so-called Medigap policies is AARP, which spent millions of dollars helping to get Obamacare passed. This is the same AARP that makes upwards of $1 billion in profits from marketing Medigap policies. Clearly, if you have friends at the White House and pay your dues, you, too, can be exempt from Obamacare’s rules. This is crony capitalism at its worst as people and companies seek special favors to escape the destructive 2,800-page law. In other words, Obamacare would cause people to lose their insurance coverage or cause costs to go up if they don’t grant these waivers. Wasn’t Obamacare supposed to do just the opposite? President Obama himself is personally getting into the waiver act. He has said he wants Congress to change the law to give states waivers to implement Obamacare their own way, starting in 2014 rather than having to wait until 2017, as the law now requires. What’s really being waived here is the rule of law. The waves of waivers remind all of us how angry we were at all the special deals — such as the Cornhusker Kickback, the Louisiana Purchase, and so on — that Senate Majority Leader Harry Reid handed out to get Obamacare through the Senate in 2009. But it is also a crime against the American principle of fairness. Obamacare is barely in place, and we see administration officials using it to pick winners and losers based upon political favorites. The voices of the American people may have gone silent for now, but they will not stand for a law that would re-engineer one-sixth of our economy and demolish the core American value of equal justice and equal treatment for all. Obamacare is the most sweeping piece of social and spending legislation in our country’s history. It is extraordinary that 14 months after it was enacted, a majority of the American people still want it repealed. 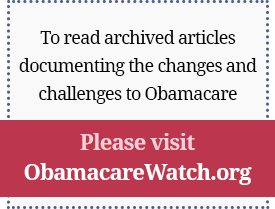 The waivers are just one more reminder of why Obamacare will not stand. Grace-Marie Turner is president of the Galen Institute in Alexandria and co-author of “Why ObamaCare Is Wrong for America” (Broadside/HarperCollins). Published in The Washington Examiner, May 22, 2011.